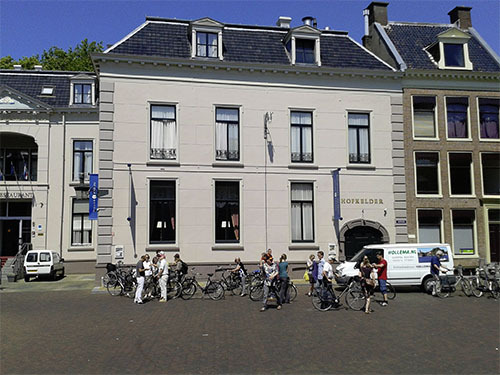 Do you want to make a nice bicycletour in the beautiful surroundings of Earnewâld, then you are also at the right place at Hollema Rentalbusiness. You can come alone, but you can also bring 100 people along. We do have a wide range of bicycles for ladies and men, bicycles with and without gears. Some of our bicycles are elektric. For the kids we have small bicycles in different sizes and of course there are special seats for the smallest kids, which can be put on the regular bicycles. We have 4 tandems for rent. When you rent a bike, you will be provided with a bicycle route. We have routes starting from 10 km. up to 50 km. They lead you to the villages where you maybe like to go, such as: Grou, Warten, Noardburgum, Beetsterzwaag en Eastermar. In these bicycletracks you can read about highlights in the surroundings, like the birdwatchinghut, the storkstation, old churches and musea. Also you will find information about restaurants etc. In some tracks it is necessary to take a ferry, which puts you over a canal. We deliver bicycles at the bungalows of Vakantiepark It Wiid. When you would like us to deliver your bicycles as well, we advise you to make your bicyclereservation before your arrival. The surroundings of Earnewâld are especially attractive for a bicycletrip, but with the bikes it is like with the canoes: we can also bring the bicycles to a location of your choice. In case you want to start cycling with a group at this location and return to Earnewâld from there. Or if you would like to make a bicycletour with a group in the area of your desire. Maybe that is the village where you stay and there are no bicycles for rent. We already brought our bicycles to places like Birdaard, Hogebeintum, Vrouwenparochie, Eastermar, Leeuwarden, Drachten, Grou, Heerenveen, Harlingen, Cornwerd, Jorwert and Hilaard. 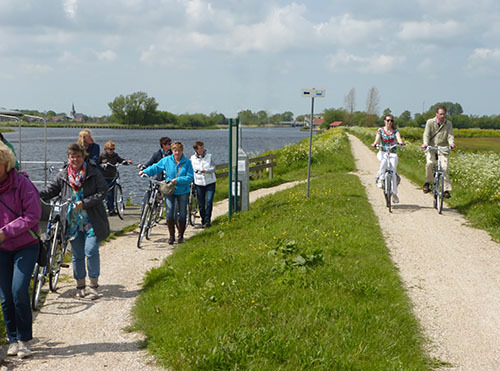 Don’t hesitate to contact us for expressing your desires and to find out the possibilities about cycling in Friesland. 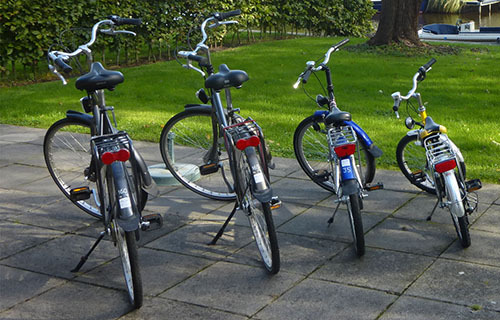 Our bicycles in front of Hotel 'Het Stadhouderlijk Hof', Leeuwarden.